All-in-one camera light w/no external cables. Lightweight and compact with long life LEDs. 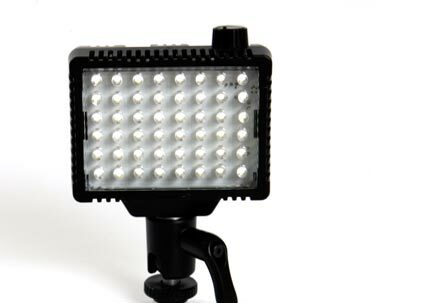 Continuous output of bright, video-friendly soft light. 100% to 0 dimming with no noticeable color shift. Uses standard or rechargeable AA batteries. Runs 1.5 hours on four AA batteries (Alkaline), 7-8 hours on E2 Lithium AA batteries. Flicker-free at any frame rate or shutter angleFills in shadows.